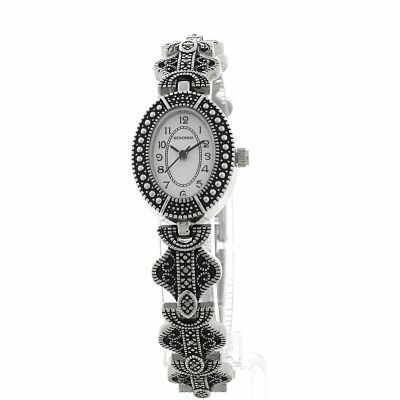 Very pretty marcasite watch. This is the second one I've purchased - the battery in the previous one lasted over 6 years! Service also excellent - would definitely recommend. Excellent service from order to delivery, I was pleased with the item but it is a gift intended for a birthday, to be given at a later date. Not sure if the wrist band will fit yet ? I love this watch. I do not like the normal every day watches you get,love something a little different and this is definitely it. I am delighted with my watch. Looks beautiful, perfect fit and keeps excellent time. Great watch very unusual. Love the way u can take 1 clasp off to help fit better. Great service watch arrived within 2 days of ordering. I purchased this watch once before but left it on holiday ... boo hoo. So had to buy a replacement. This is a really beautiful, and very feminine watch. Absolutely love it. With the marquesite design, it looks antique yet modern at the same time. Suitable for both daytime and evening. I managed to get some earrings that go will with it. It i a good time keeper and the original battery lasted over a year on my first watch. The price makes this a really good watch to buy also. I simply love this watch, I just love the marqusite look, its sophisticated with its silver and distinctive black shading and it feels so nice on the wrist, the style of the links are intricate and very pleasing to the eye and you have the choice of having it a snug or loose fit, due to the double clasp. The watch face is a flattering oval shape and easy to read the time. This is the second one Ive bought as my first one I had an accident with and it couldnt be mended, I didnt hesitate in buying another one. Excellent quality and extremely good value for money. lovely, pretty and delicate watch which was a perfect fit for my small wrist once the removal link was taken out. This is a lovely watch. Just perfect. Delicate and quite unusual - bit like an ornate bracelet but with a clear head - perfect. I get so many compliments about it. Beautiful, elegant watch. Sparkly yet understated. Small but easily read dial. And easy to adjust strap. Perfect watch for ant occasion. For the price this is a really lovely looking watch, this is exactly what I have been looking for. Fantastic watch, looks stunning on. Its a good watch, but the watch strap is fiddly to put on. In general its a very nice watch. This watch is stunning. Ornate looking and perfect for any age! I bought this for my mother in-laws birthday and she loved it. The online image doesnt do it justice. Very good purchase and delivery was prompt! I love this watch, it is so girly. My husband bought me it for my birthday the other year and I lost it!!...... So I needed a replacement fast! The Watch Shop did send the wrong one in error mistakes happen, I know this but they soon replaced it and refunded me the deliery charge, I have no complaints. I would be happy to come back to them for future purchase. Watch looks lovely and looks well worth the money,but as its for a gift cant say much more. I bought this watch as a Christmas present for my mum, she was delighted by it! It looks so much better in real life than the pictures, its very smart and looks very good on. Highly recommend it for anyone looking for a classy, smart watch. I bought this watch as a gift for my wife and she really loved the style. The watch strap was a bit long but could be shortened by what seems to be about 6 - 8mm at a time as each link is quite long. My wife is now wearing it everyday. The watch is perfect, its unique and very classy looking. My wife was over the moon with it. Its got a antique quality to the look and people comment on it all the time, well worth the money. I ordered this as a replacement for one I lost same watch. Ive been wearing it day and daily for a few years now and it still gets compliments. If youre looking for a delicate, vintage-style watch, I would recommend this one. Really love this product! It is really stylish, exactly what I was looking for, it looks like a beautiful bracelet. It is a little big around my wrist, but personally I like having a larger watch, so it isnt an issue. Top buy, for my money! Lovely watch, not too dressy for a teenager. Lightweight to wear and comfortable. Easy to adjust to fit wrist. Bought this watch for my mum, she loves it, was the right size as I put her wrist measurement on the order, no fault on it at all, and delivery was very good also. Lovely watch although the strap is a little small without the extender clip and a bit too bit with it. This watch is great. The colour and style goes with every think. I enjoyed how the watch looks vintage and Victorian. I got compliments about how nice the watch looked. Excellent service,beautiful watch will reccomend to all my friends. super fast delivery wish I knew about you sooner. Watch though look wise old, but once wear it , its stylish.I am happy about it. thank you. Excellent choice of watches and delivered inside the time frame, very happy with the service and the communication regarding the status of the order. Picture does not do watch justice. Absolutely beautiful in the flesh. Delivered as promised - I will definitely use Watchshop again. Always tricky to tell how something will look till you have it in your hand , so to speak , but this watch is just what my wife wanted and is well pleased with its looks and quality. Thank you. My mother was very happy with the watch on Christmas day . The watch its self was nicely presented and well made. Sekonda are a reputable company. It was exactly what I was looking for as a gift. Beautiful antique looking ladies watch. Purchased for my wife. She loves it. This is a gift for my daughter for Christmas. It is a beautiful watch, the detailing on the strap is lovely, it is excellent value for the money I paid for it. The face is just the right size and I am sure it will look great with my daughters other jewellery. An excellent product and great value for money - I cant wait for her to open it! Bought this watch for my mother as a birthday present. She wanted something like an old coctail watch she had many yearas ago. I was impressed with this watch, it looks more expensive thatn it was and my mother loved it. What a charming watch I am abpsolutely delighted with the product and can not wait to wear it for my Birthday on 13th April. Your deliverey service is first rate no messing about like the shops do and it arrived in two days. It fits perfectly with your carefully designed adjustable strape an excellent idea and design, The first watch I have not had to take to be altered. Such joy! I wanted it to complement my existing jewellery and at that price never expected to find anything with such chearm. No one will guess the value when I am kitted out ready for the party! The cost is exceptionally and great value.another very happy customer. I can read the clock face with ease which as so many watches are hopeless in this area. The funny thing is I was looking for a different kind of watch and stubbled on this one by accident,I am so glad Thank you. This was my wifes xmas present and she loves it. It was to replace an old watch that she had for years and loved but this is an ideal replacement. The style is great and the face clear. Bought this watch for my girlfriend. She loves things anything that resembles the victorian era and this watch was perfect. Very well made and looks a million times better than how it looks online, 10 out of 10.
this item was just what i was looking for, it looks victorian, was bought for a present and i know she will love it because of this. This is a beautiful watch. I wanted a watch for evenings out, something that was special, delicate and feminine yet reliable. This watch looks so dainty on, so feminine and goes with any outfit. I have had people comment on it and thinking it cost a lot of money!!! I love it. It goes with my marcasite bangles I wear on the other wrist. Now just need to look for some matching earrings!!! it was a nice watch fits well though it took a week for me to recieve it i am happy with the watch it was not as shiny as i saw in the website. I purchased this as a gift for my daughter and she is absolutely delighted with it. It looks great on. I would recommend it for any females who prefer a watch that is slight different in looks. Exactly what I wanted to compliment a wedding outfit. A great price that I couldnt have got elsewhere - great value for money. It looks wonderful on my wrist and there was need for adjustment as it is a perfect fit. Beautiful watch and i looked through literally hundreds. I love it! Clear numbers which i like but also ornate a little bit different. really nice watch. trust me, the picture doesnt do it justice. a truly classic design, clear n easy to read dial. Looks just like illustration... in fact probably looks better than I'd expected! Love the marcasite detailing- exactly what I wanted to match other jewellery. Aesthetically pleasing, clear face on watch. Clasp is sturdy. I ordered a ladies Seconda evening watch as a gift and it arrived in perfect condition as advertised within three days. Better still i ordered this watch from another well known on-line dealer. After chasing delivery for three weeks i had to cancel that order when they finally stated that they did not have any in stock. If i need another watch i know which company i will deal with. Well done WatchShop. Really nice watch, the picture doesn't do it justice. I thought for the price it would be quite small and fragile but it's actually a decent size and gorgeous. It's a present for my mum and I like the fact she can adjust the strap herself if she needs to without having to take it to a jeweller. Very pleased. My daughter (16) chose this watch and is very happy with it - thinks it's pretty. I wasn't overly impressed by the build quality - the links of the bracelet catch on each other a bit. I have received my new watch last week when I had to order one immediately when my old silver Sekonda watched had fallen off of my wrist smashing and breaking the glass insert. The new marcasite jewel incrusted ladies watch was better than I had imagined. It has an Art Deco feel to it with ample room for alteration to fit most sized wrists. The mother of pearl watch face is really pretty and I would certainly recommend it to any lady. This watch is even better than when viewed on screen.